Here is a collection of charts, in no particular order, that I have updated in the past week and which I think are worth noting. If they have a common theme, it's that economies both here and abroad continue to improve. The message of this chart is that the real value of the S&P 500 index has increased in line with the physical expansion of the US economy for the past 45 years. As a proxy for the economy's physical size, I've used the American Trucking Association's index of total truck tonnage hauled by the nation's truckers. 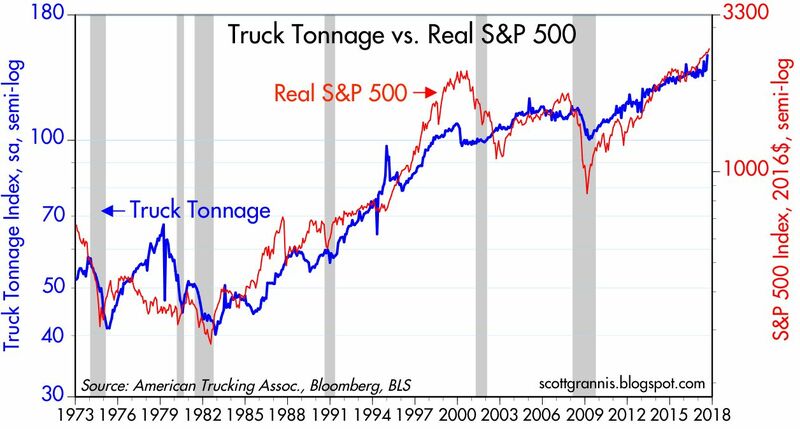 I note that there have been a few times when equity markets have diverged significantly from the the trucking index, particularly the late 1980s, the late 1990s, and during the depths of the 2008-2009 recession. I would characterize those as periods of excessive optimism and pessimism—sentiment not warranted by the progress of the overall economy. 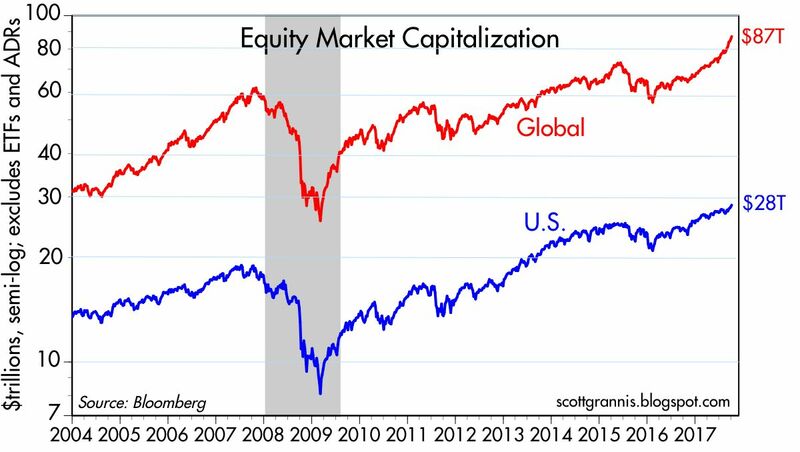 Currently, the advance in equity valuations seems to be very much in line with the growth of the economy. Today the Japanese stock market reached a two-decade high, after not making much progress on balance for a very long time. 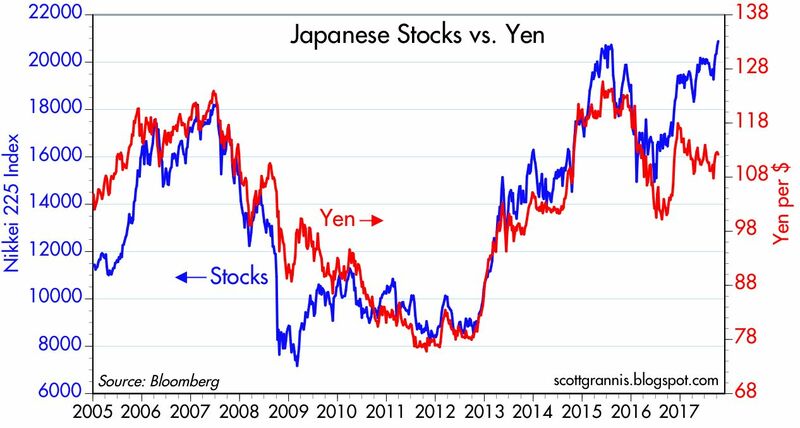 It's interesting that this occurred despite the fact that the yen has been strengthening of late against the dollar. As the chart above shows, since 2005 Japanese equities had shown a strong inverse correlation to the value of the yen (e.g., equities would rise as the value of the yen fell, and vice versa). People have made various attempts to explain this inverse correlation, with perhaps the most convincing being that the Bank of Japan has been pursuing misguided monetary policy at times, such that a stronger yen (one result of very tight monetary policy) put a lot of downward price pressure on Japan's industries (because it made their products more expensive to foreign buyers), while a weaker yen mitigated this pressure and eventually became "stimulative." I'm not quite sure what to make of the action offer the past year or so, but I think it may be that the yen has settled into a reasonable valuation zone. Perhaps not coincidentally, my calculation of the Purchasing Power Parity exchange rate between the yen and the dollar is about 114, which is very close to the current exchange rate of 112. This further suggests that central banks have been doing a pretty good job of managing things, and currencies are trading at reasonable levels in general. (The Fed's Real Broad Trade Weighted Dollar index is currently very close to its 45-year average, by the way.) This suggests that the uncertainties that arise from significant currency fluctuations have been mitigated, and that further suggests that economic fundamentals have become more conducive to investment and growth. Reduced uncertainty is almost always good for investors, and for investments, and for economies. 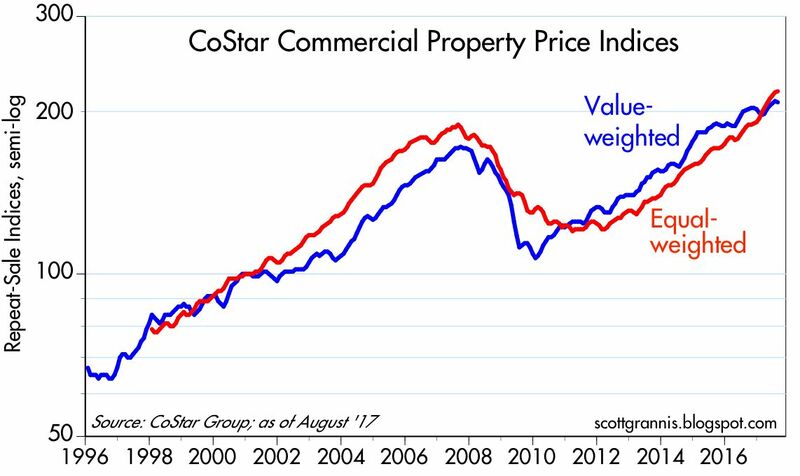 As the chart above shows, property prices for commercial real estate continue to rise, and have clearly surpassed their prior peak. You hear a lot these days about how shopping malls are dying all over the country (thanks to predators such as Amazon), but this suggests that things are not necessarily bad at all in general. 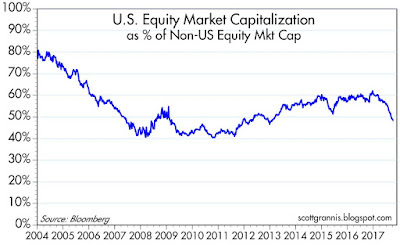 The charts above are based on Bloomberg's calculation of equity market capitalization. I note that non-US equity markets have been strongly outperforming their US counterparts for most of the past year. 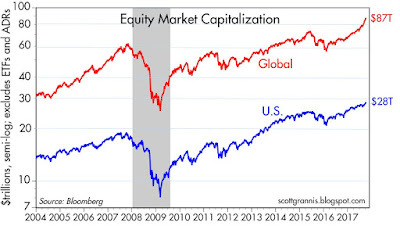 However, all markets have registered equivalent gains for the past decade or so, on balance. We're in a global recovery that shows every sign of continuing. 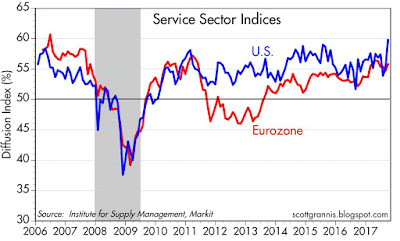 The September ISM survey of service sector businesses in the US was extremely strong, as the chart above shows. This could well be one of those random blips, but at the very least it suggests that the US economy continues to improve. 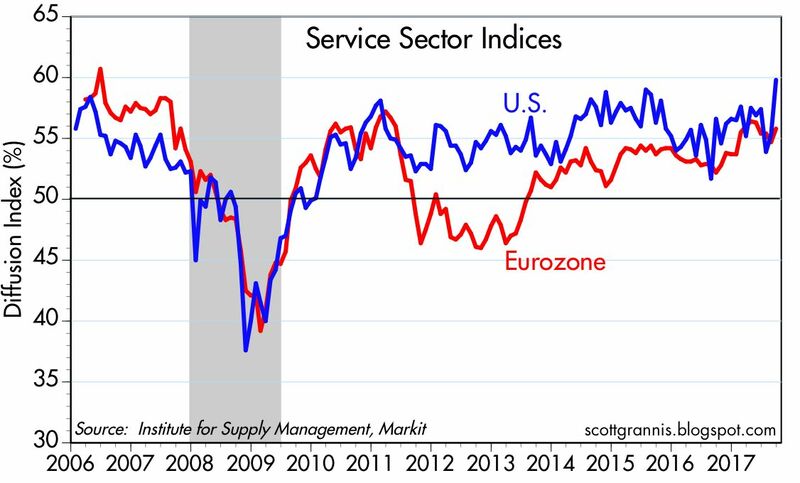 It's also worth noting that a similar index of Eurozone service sector businesses has been trending higher for the past several years. It looks like we're in a synchronized global growth cycle. 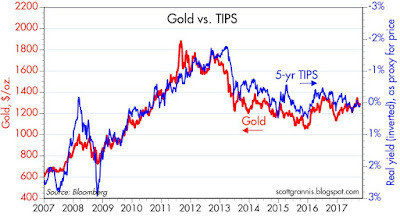 I've commented often and for years about the curious and continuing dance between gold and TIPS prices, as illustrated in the above chart (see a recent post here). I've also commented on how the real yield on 5-yr TIPS (shown inversely in the chart in order to serve as a proxy for their price) tends to move in line with the real growth trend of the US economy. With 5-yr TIPS real yields only slightly above zero, the market is apparently unconvinced that any good will come from the Trump administration, at least insofar as something that might push the US economy out of its 2% real growth rut. If there is anything that makes a convincing rebuttal to the widespread claims that the market is insanely optimistic and egregiously overpriced, this chart is it. 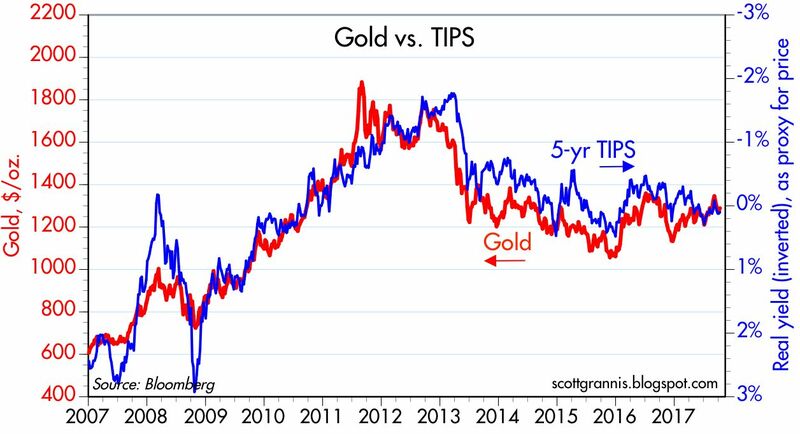 If the market were convinced that the economy was on the cusp of growing 3% per year or more, I think real yields would be significantly higher and gold prices would be significantly lower. 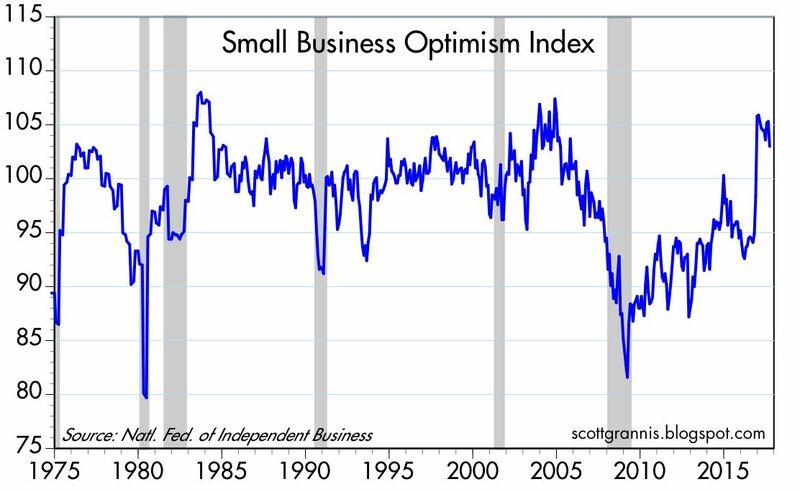 The most recent survey of small business optimism showed a downtick, but the index is still at rather lofty levels. 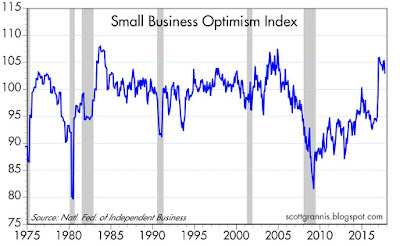 Small business owners are already seeing a reduction in regulatory burdens, as are banks. It may well be the case that entrepreneurs are already gearing up for better things ahead, but that we won't see the results (e.g., more hiring, more investment) for some months to come. These things take time to unfold. 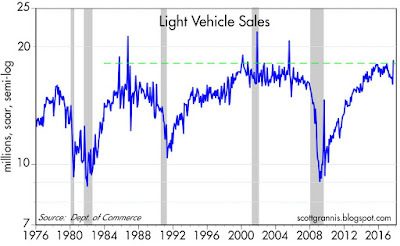 As the chart above shows, car sales had been in a disturbing slump since last year. Fortunately, the September numbers revealed a substantial bounce. This may be just one of those quirks of seasonal adjustments, so we'll have to wait for a few more months to declare victory, but it is nevertheless encouraging. Could you please explain what metrix are you using to arrive to the Purchasing Power Parity exchange rate between the yen and the dollar (which you believe to be about 114)? Re Japan and PPP. 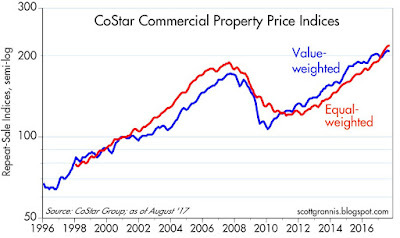 A currency's PPP value is, in theory, the value of the currency that would result in country A's prices being roughly the same as country B's prices. The methodology requires some assumptions, namely the choice of a period during which prices were roughly the same, and then adjusts that currency value by the difference between inflation in country A and country B. Another great wrap by Scott Grannis. 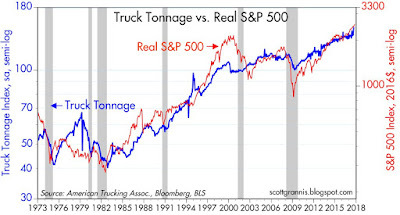 Maybe a murmur of caution: I happened to look at the trucking figures of late. Evidently, the rails raised rates in the last few years, especially for inbound cargo containers. Something about 10-year contracts expiring and then 35% rate hikes. Also, more shippers want to get the containers quickly to a truck terminal, where is can be broken down, re-configured and re-trucked to final destination. Rapid delivery rules today. The upshot is that more transport business is flowing to trucks, and this indicator may be reading "high" compared to recent decades. That said, yes, I think we in a sodden "Goldilocks" economy: Not too hot, and not too cold, but tepid. Other note: China and Japan combined now represent economic heft at about 150% of US GDP, and much larger in the world of commodities and manufacturing. Both China and Japan have mildly stimulative monetary policies in place. We may see the global economy pull the U.S along. The Far East investment guru consensus is that China is growing and will keep growing, for at least another year. They changed their minds from last year, although the China-bears are always with us. This chart shows declines in rail freight carloads. Some writers at the National Review are worried about federal deficits. "I was invited to speak to a group of Republicans on the House Budget Committee, and I told them as plainly as I could that the decisions made by their panel and its Senate counterpart over the next several years would very likely mean the difference between a relatively manageable national fiscal crisis at some point in the future and an uncontrollable national fiscal catastrophe with worldwide consequences. I also told them that I was not entirely confident that they’d make the right choices. I wasn’t invited back." Does the US face "an uncontrollable national fiscal catastrophe with worldwide consequences"? That does sound grim. Williamson also mentions the GOP wants to increase federal military outlays (I regard the federal government as having a reverse Midas touch, nowhere more so than in foreign occupations). In Japan, the Bank of Japan now owns 45% on the national debt, through quantitative easing bond-buying, I call this Mobius Strip economics. Japan taxpayers owe a lot money, but to themselves. Do federal deficits cause inflation? In 2009 Martin Feldstein said the federal debt monster would lead to inflation, and advised shorting bonds. Since then, yields on 10-year US Treasuries fell from high 4's to low 2's. Re rail freight carloads: the weakness in the series Benjamin cites is mainly due to declining rail shipments of petroleum products and coal (coal consumption is down due to increased reliance on natural gas, while more petroleum is being shipped via pipeline). Intermodal rail freight traffic (containers) has been increasing and is now at an all-time high, having increased 3.6% over the past 12 months. Re deficits and inflation: there is NO demonstrable evidence that federal deficits create inflation. Inflation is a monetary phenomenon, not the result of federal borrowing. The federal deficit could become problematic in the future, however, if measures are not taken to boost economic growth and slow the growth of entitlement spending. Failure to act on these fronts would most likely result in sluggish economic growth, but not necessarily higher inflation. A big debt loan coupled with meager growth is what has brought Greece to its knees. This could happen to us, but it is still many years in the future. This economy has been improving, yet growing at a snail's pace since President Obama took office near March 2009. I have been a constant critic of fiscal policy over the past 8 years, insisting what was needed in the U.S. was faster growth. Too many economists seemed very willing to accept the "new normal" and did not call for measures to generate faster growth. We did not have a recession under either President Clinton or Obama. Democrats always worry me because they always seem eager to raise taxes. Now we are talking about lowering taxes. I like that, but here's my worry. I fear that what I would view as a constructive and fair change in tax policy will help boost the economy to maybe 4%+ growth which could cause the tepid FOMC to raise interest rates aggressively and choke the growth, sending us into another recession under another Republican president and causing another stock market crash in 2018 or 2019. I too worry about federal debt and the rise in unfunded liabilities, especially from the growing Social Security and Medicare demands from an aging baby boomer population. I have wondered if a decade of robust, China-like, economic growth without deficit spending couldn't go a long way in reducing those debts. I am going to pray diligently for the next Fed chair (whether Yellen or not) because it is going to require wise management in order to keep this U.S. economy growing and producing prosperity without inflation. Well, I am a not a real economist, just an econo-junkie, so I am not the guy to render a verdict on this one. Certainly, some big names in economics, such as Martin Feldstein and John Cochrane have waxed long and hard on federal deficits leading to inflation. So, if not federal deficits, then monetary policy? But here is the problem: We have a monetary policy described as "ultra-super-wide-open" now since 2009. We are at 1.4% core PCE. The CPI core minus shelter is under 1% YOY. Japan has a robust QE program, holds interest rates on 10-year JGBs at zero, pays negative interest on reserves, and has more job opening than people looking for work---and cannot get to 1% inflation. Well, I give up. I sure do know what causes inflation, but for now it does not seem to be fiscal or monetary policy. Concerning rail freight carloads, Mr. Grannis is right. I have followed this economic indicator every week for many years. Click on "total intermodal units" at the link below -- not "total carloads and intermodal"